Physical Description Athletic build, has a scar down his left cheek that pulls the side of his mouth upward in a slight smile or sneer. Has a tattoo on his right arm of an Anchor with a quote from Winston Churchill, "In war peace, In resolution goodwill. General Overview Caleb is a very calm individual, and very optimistic. He does not get angry easily but when he does his temper can get the best of him. Strengths & Weaknesses His strength is the ability to gather as much information as possible and make decisions using the information on hand. Ambitions His goal is to one day command his own Starship, and upon his retirement he wants to lead a colony to begin a new planet. Hobbies & Interests Cody's hobbies include reading and cooking. He has taken several classes on alien cuisines and enjoys cooking rare food dishes and desserts. He also enjoys antique weapons and fences regularly when given the opportunity. 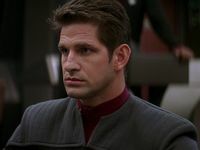 Personal History Cody's dad was unable to join Starfleet due to an injury he sustained when he was a child, and now lives vicariously through his son, Cody's career. The constant travel helped Cody's mother become exposed to new cultures and different types of food. Now that Cody's father is retired she has opened her own restaurant in Mobile, Alabama that is an interesting mix on several alien dishes with a Gulf Coast Cajun flair.